We buy junk cars, vans, SUVs, and trucks and pay cash in Massachusetts! Are you looking for a wicked awesome junk car buyer in Massaschusetts? Got an old junk car sitting in your yard that you’ve been procrastinating getting rid of? It might be time to call The Clunker Junker. We’re currently paying the most cash for cars in Massachusetts, and we’ll even remove the vehicle from your driveway completely free of charge. Stop wasting your precious time trying to find someone to buy your car on Craigslist. We’ll make an instant offer right now, and have it towed away within 1 to 3 busines days, in most cases. Between the Red Sox, New England Patriots, Boston Celtics, and Bruins, Massachusettes has winning in its DNA. When you sell your junk car in Massachusetts to The Clunker Junker, you’ll be on the winning team. Our cash for junk cars service is second to none, with the best offers and unparalleled customer service. You won’t find a better junk car buyer in Massachusetts. Like Tom Brady, we are the G.O.A.T. car buyers! Our founders, Eric and Valerie, grew up in Massachusetts and New England holds a very special place in their hearts. They know just how bad the bitter cold winters can be on your car. Whether your junk car is rusted out due to years of road salt, or the suspension is broken from hitting a crater sized pothole, The Bay State can be harsh on automobiles. Luckily The Clunker Junker will buy your junk car regardless of what condition it’s in, as long as it is a complete vehicle. There is no easier way to sell your junk car in Massachusetts than The Clunker Junker, so give us a call today and get your instant offer! How much can you sell a junk car for in Massachusetts? Some junk cars don’t have any purpose and are just taking up space. Your rusted and rotting truck might be worth its weight in scrap metal. However, we buy junk cars in Massachusetts in any condition. While you’ll probably get more cash for a newer Mustang that’s been in a bad wreck, than a 1990s Honda, both cars are valuable. Manufacturers usually stop making parts for cars that are more than a few years old which can make cars in this category a potential gold mine. Even though these cars aren’t in great shape, they’re still useful. Certain used vehicles still interest us! Don’t be fooled by our name. If you’ve got a car or truck that still has some life left in it, we’ll take it off your hands. We pay anywhere from $200 to $10,000 for vehicles in this category. It’s easy to get cash for junk cars in Massachusetts. When you give us a few details about your car, we make you an offer, and if you accept the offer, then we come to pick up your car. That’s how easy it is to get cash for your old and rotted car. The Clunker Junker will pay top dollar for junk cars, even if they are in terrible condition. We find the right buyers for your car after you answer a few quick questions. You tell us your car’s make, year, model and current condition so we can give you an instant offer and find the right buyer for your vehicle. Once we have all the info we need, our state of the art valuation software will generate an instant offer, usually within a few seconds. If you choose to accepte the offer, we'll kick off the junk car removal process. When you accept our instant offer, we’ll arrange for one of our Massachusetts junk car buyers to pick up your car. You don’t need to worry about arranging to tow your forgotten sedan or finding someone who knows how to drive that old 5-speed pickup truck. We tow it away for you. We have put together a simple guide and example for how to sign your Massachusetts title when you are selling your vehicle. If there are multiple owners listed on the title, they must all sign the title unless the names are separated with "OR". 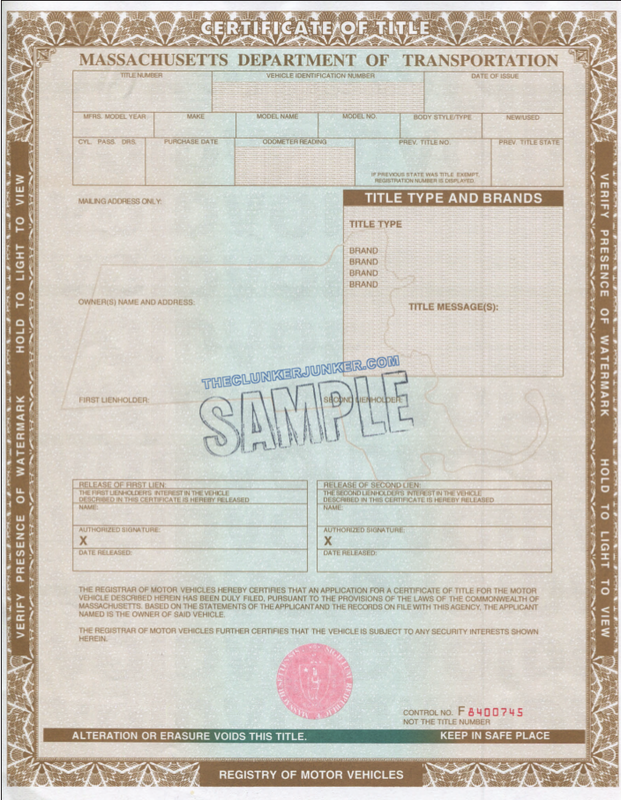 When signing, flip your title over to the back and make sure you are using the "Assignment of certificate of title by owner" section towards the top. Never write anything in the "re-assignment by licensed dealer" section! First sign the back of the title where indicated by "Signature of Seller(s)". 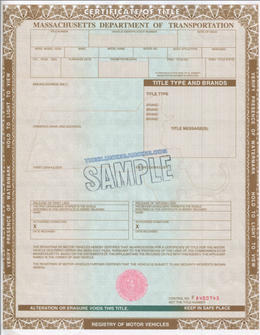 Print (don't sign) your name on the back of the title where it reads "Printed Name of Seller(s)". Use the online Massachusetts duplicate title form. 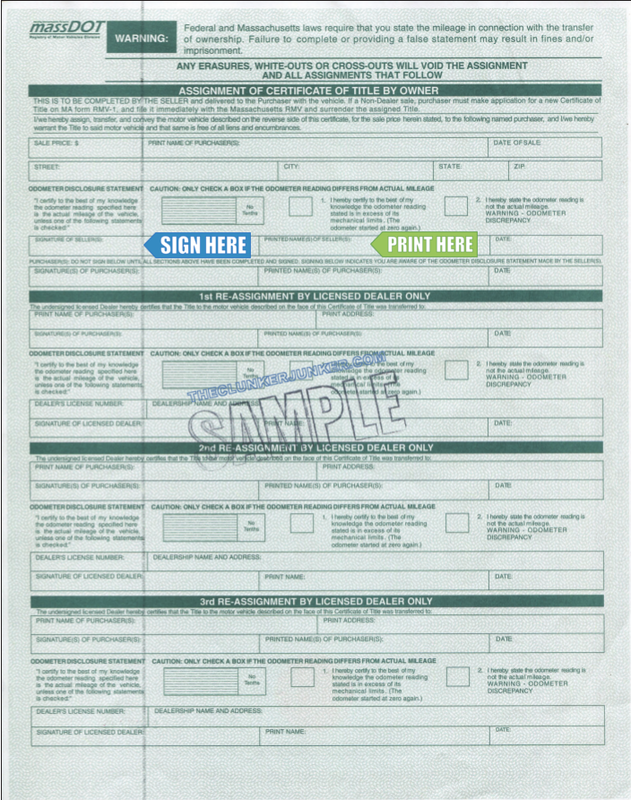 Or fill out the physical form. Please note that there may be a seven to ten day waiting period before a duplicate title can be issued and the cost is $25.00. (Paid to the MassDOT). Getting rid of an abandoned vehicle in Massachusetts can be a difficult process. Unfortunately, you cannot just sell any junk car that ends up on your property if you do not own it. You'll need to follow the Massachusetts abandoned vehicle removal procedures. We have given a general overview of what that entails below. A vehicle may not be removed from private property unless a written notice has prohibited the vehicle from being left there. If there is a written notice, the owner of the private property may submit a request to local law enforcement. If approved, law enforcement will dispatch a tow truck to remove the abandoned vehicle. To apply for the title to the vehicle, you must attempt to locate the registered owner of the vehicle by using the 17-digit VIN number at your local RMV. If no registered owner is found or after a notice has been returned undeliverable via certified mail, the vehicle will be sold at public auction. Can you buy vehicles in Mass without a title? Yes, in many cases (but not all) we can purchase your vehicle without a title. You will need to prove ownership by presenting a photo ID that matches your current (non-expired) registration and or insurance. Offers for cars without title will be less and we in no way guarantee that we or our buyers will be able to purchase the vehicle without the title. 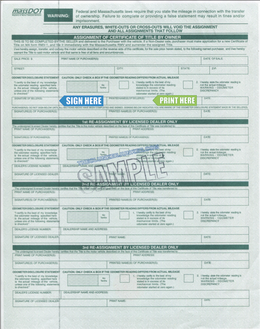 Massachusetts often changes their title documents from year to year. If you have questions about your specific title, please contact your Massachusetts RMV. Yes, unless you are transferring the plates to a new vehicle. You can return the plates to your local RMV office. You may need to notify your local RMV that you have sold the vehicle. You can contact them with any additional questions or concerns about the transfer of your title. We don’t charge you fees for towing or recycling. The Clunker Junker puts cash in your hand without fees and picks up your car as quickly as possible. Visit our website today and check out the instant offer for your car. "I would use this vehicle for work (delivering mail). I had the engine and transmission rebuilt in November/December of 2013. About nine months later, my route received a company vehicle, so I no longer used it. I last started it up and drove it to a body shop about seven months ago where it has been sitting since then. The body is beat up, and the vehicle does need a lot of other moderate repairs." "My mom gave the vehicle to my son. She doesn't have the title but doesn't want the truck. She wants to junk it and I can't get it back out of state. It's in my driveway. " "The vehicle is missing the diver-side door handle inside and out. The driver seat is missing bolts. The motor in the window is dying. There's one seat belt in the back seat. It starts but doesn't stay on. I have no idea what exactly the problem is. " "The vehicle has a brand-new radiator, emergency break, and I just had a tuneup done when the transmission gave out. The mechanic said it could just be the filter, or it could be the transmission itself. We've been fixing it up since we bought it but need to get another car fixed instead. " "The vehicle needs the main computer. You can get one for $100. All three computers will work for that year and model. I just want to junk it for some cash. I don't have time to work on it." "The reason I need to junk it is that the keys were stolen, and it will cost over $1,000 to get a new key made. It's currently at the dealership. It still runs (or it would if it had a key), and it got a new hybrid battery for $4,000 about 45,000 miles ago. " The Clunker Junker is one of the top junk car buyers in the state of Massachusetts. To date we have made instant offers on over 30 thousand vehicles across the state, totaling over $8 Million offered! Of those vehicles, approximately 7% were purchased without a title. We also buy cars on a wide spectrum of conditions and 48% of the vehicles we've made offers on in Massachusetts do not start or drive. Many also have moderate to severe body damage. New Bedford in Bureau County was our top producer, followed by Springfield.